Over a million people have been overcharged for registering Power of Attorneys in the last few years. If you paid to register a Power of Attorney in England or Wales between 1st April 2013 and 31st March 2017, then you are entitled to a refund of up to £54 as you were quite simply overcharged. 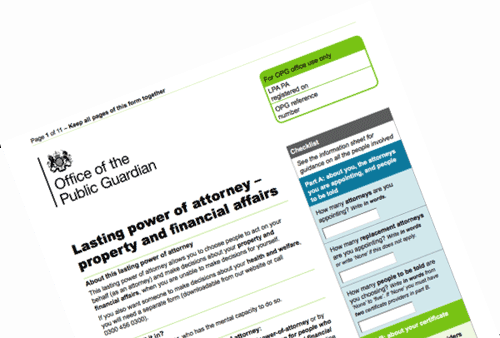 There is an application fee to register a Power of Attorney, which is set by the Ministry of Justice and paid to the Office of the Public Guardian. Between 2013 and 2017, the operating costs of the Office of the Public Guardian decreased, but the Power of Attorney application fee stayed the same for four whole years! As the fee is supposed to cover just the operating costs, the Government will now repay the difference between what applicants paid and what they should have paid, plus a small amount of interest; but only if they apply for the refund – the refund will not happen automatically. The Ministry of Justice has confirmed that 1.7 million applications are affected. It’s not clear exactly how many people are owed a refund, as many people will have registered both types of Power of Attorney, but it is certain that over a million people are affected, and are due a refund, and with the average refund of £40, there is over £40 million waiting to be refunded. You can make your own judgement as to the lack of efficiency here, and take your own view on the scandal of over one million people being overcharged, and why they are not being automatically refunded. A Lasting Power of Attorney (LPA) is a legal document which allows you, while you still have the mental capacity to do so, to nominate a trusted friend or relative to look after your affairs if or when you lose your mental capacity. There are two types of Power of Attorney, one for health and welfare, and one for property and financial affairs. Some people will have registered both types of Power of Attorney and so can thus claim a refund of up to £108. How much you can reclaim depends on when you paid for the Power of Attorneys which is calculated on a sliding scale for all applications from April 2013 to March 2017. You can make a claim if you were the person who made the Power of Attorney or you are the person appointed in the LPA; with the refund being paid to the person who made the LPA. You can claim a refund even if the Power of Attorney has been used. You can claim a refund online via the gov.uk website, or by phoning the Office of the Public Guardian’s helpline on 0300 456 0300. You don’t need the Power of Attorney document itself, but you will need the person’s name, address, date of birth, bank account number and sort code and the name of one of the people mentioned on the LPA. Either way, do apply for a refund – you are entitled to it. There are many terms that are used in relation to Wills and Probate, and here we explain some of these commonly used wills and probates terms in plain English. The person who deals with the estate of a person who has died intestate (without a Will). The proportionate division of a deceased’s estate between certain beneficiaries. Property, money and other belongings owned by the deceased. A person, typically a lawyer, but not always, who is appointed to act for another in business or legal matters on their behalf. Confirmation or verification. It is often used as a term when witnessing a signature. Anyone or any organisation that is entitled to a share of the estate of the deceased. Any gift left in a Will that is not land or buildings. This is a tax on the profit made when selling an asset. Any movable personal property or belongings that is not used for business. Examples of personal chattels would be ornaments, jewellery, furniture, clothes and so on. An addition or change made to a Will, for example, to increase a cash legacy. There is no such thing as a common law spouse in law. The Court of Protection in English law is a superior court that has jurisdiction over the property, financial affairs and personal welfare of people who lack the mental capacity to make decisions for themselves. A trust where the trustee has the full power to decide when and to which beneficiaries are to receive their capital. Domicile is a concept of general law. Domicile is distinct from nationality or residence. Broadly speaking your domicile is the country where you have your permanent home, and you can only have one domicile at any given time. All the possessions of the person who has died, including all property, cars, investments, money and other belongings. The persons or organisations appointed in the Will to administer an estate. A transfer from one person to another without fair compensation in return. A legacy left to others in a Will. 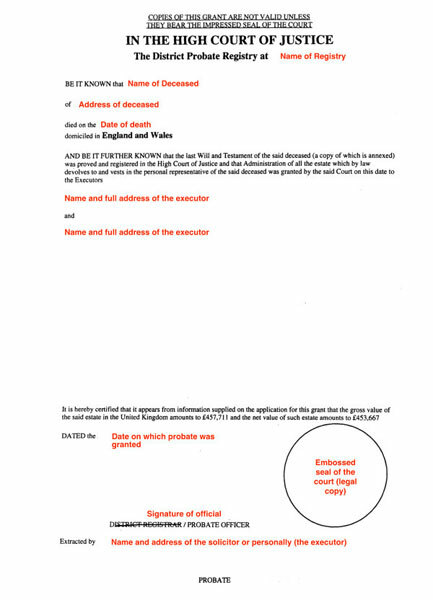 The document issued by the Probate Registry to the executors to authorise them to deal with the estate. The grant is a legal document issued by a court which confirms that the executor has the authority to deal with the deceased person’s assets. This document must thus be obtained before the executors can start closing accounts and liquidating assets. The person appointed by a parent or a court to have parental responsibility for a child under the age of 18 years. This is the act that allows people to bring a claim for inadequate provision under the terms of a Will or intestacy. The act makes provision for empowering the court to make orders for provision for the spouse, former spouse, child, child of the family or dependant of that person. The tax that is to be paid when the total estate of a person who has died is more than the current inheritance tax threshold. The name for the situation which arises when someone dies without having made a legally valid Will. Their estate is then distributed according to rules laid down in law governing intestacy. When there is a shortfall of funds to meet all liabilities at the time they are due. Property that is owned by two or more people in equal shares. Joint tenants are usually husband and wife and in the event of the death of the first person, the share of the property they owned would pass automatically to the surviving owner and would do so outside the terms of any Will. A legal document that lays out the way a person wishes to have their estate distributed upon their death. A Lasting Power of Attorney can relate to someone’s property and affairs or their personal welfare. Their purpose is to meet the needs of those who can see a time when they will not be able to look after their own personal, financial or business affairs. The LPA allows for appropriate arrangements for family members or trusted friends to be authorised to make decisions on their behalf. The Laws of Intestacy dictate how an estate is distributed should a person die without leaving a legally valid Will. A form of property tenure where a person buys the right to occupy land or a building for a given length of time. Ownership of the property will pass to the landlord when the lease comes to an end. A gift of money (usually a specific amount) left to someone in a Will. An appendix to a Will detailing specific wishes not covered by law. This would typically include preferred funeral arrangements. Letters of Administration are granted by a probate registry to appoint appropriate people to deal with a deceased person’s estate where property will pass under Intestacy Rules or where there are no executors living (and willing and able to act) having been validly appointed under the deceased’s Will. The debts that need to be settled by the estate following the death of the deceased. Where a gift in a Will is coupled with a (non-binding) wish that it is to be distributed in accordance with wishes set out separately elsewhere. The nearest blood relative of the deceased. When a person dies intestate the next of kin are the people entitled to the estate, in accordance with the Rules of Intestacy. The Office of the Public Guardian is a government body that protects the private assets and supervises the financial affairs of people who lack mental capacity for making decisions. The OPG works closely with the Court of Protection. A gift of a fixed sum of money. A medical examination of the body to determine the cause of death. A gift made during one’s lifetime that is exempt from Inheritance Tax if the donor lives for seven years after making the gift. Authorisation to act on someone else’s behalf. Someone who dies before the person who has made the Will. Probate is the official process that gives the executors of a Will the right to deal with the deceased’s assets and property. It acts as proof that the executors have the authority they need to handle the estate of the deceased person. This legal procedure must be undertaken to establish that a Will is genuine and valid. A court within the family division of the High Court, that deals with probate matters. The probate registry is responsible for making sure that the Will is valid and the applicant is entitled to handle the estate of the deceased. What is left of the estate after all liabilities and expenses have been paid. The term used when the testator decides to legally cancel their Will completely and invalidate the previous Will. Property that is owned by two or more people. Joint tenants are usually husband and wife and in the event of the death of one tenant, the other automatically becomes the owner of the whole property. In these situations it is not possible for a tenant to make a gift of their share of the property to someone else as it is not theirs to give. Property that is owned jointly but each joint owner has a distinct share forming part of their estate on death which does not pass automatically to the surviving tenant. The costs of obtaining the Grant of Probate or Letters of Administration and of administering the estate. The person who sets out his wishes and requests as to how their estate should be divided in the form of a Will. An arrangement set up by Will or deed with the trustees being appointed and given money or assets to hold and manage on behalf of the beneficiaries. Someone who is given the legal responsibility to hold any assets until nominated beneficiaries meet certain criteria set out in the deceased’s Will e.g. until a beneficiary reaches the age of 21. Trustees normally have powers to distribute monies and have full power to sell and invest. Trustees have duties to be loyal, prudent, impartial and to inform the beneficiaries of the trust. A legally binding set of instructions indicating how someone wishes to dispose of their assets upon their death. The persons who must be present to see the testator sign the Will. They must also sign the Will themselves and should not be beneficiaries of the Will. We hope this Wills and Probate glossary guide has been useful. 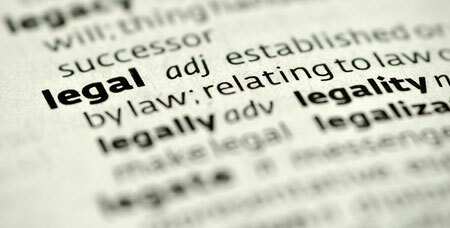 If you want to find out more you can check this comprehensive Wills and Probate Glossary. Meantime, we hope this guide will help you create a Will. The Probate Service has said that it is now accepting personal applications online, providing that the applications meet certain criteria. 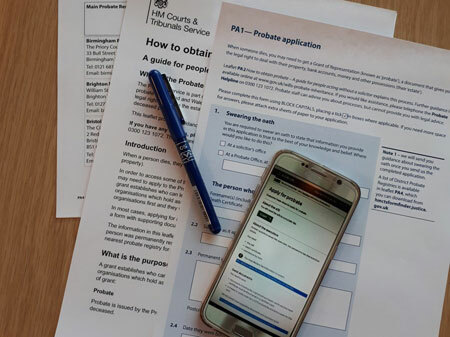 If you are the executor of an estate in England and Wales, you can now apply online for probate using a new digital service launched by HM Courts and Tribunal Services. At first the service will only be available to personal applications from executors who are acting alone and have a copy of the original Will. If the Will has been updated with a codicil, the executor will still need to submit a paper application. How does the online probate service work? The online probate service will allow an executor to submit details online to obtain a grant of probate. However, it is not a fully digital service just yet, as there is still a need to send through copies of the necessary paperwork, including copies of the Will and the Death Certificate. Applying online will of course save executors time, and there will no longer be a need to visit the probate office or a solicitor’s office, and all the hassle that entails, to swear an oath. How much does it cost to apply for probate? When you apply for a grant of probate, you will need to pay a fee, which is currently set at £215. However, if the estate is worth less than £5,000 this fee is waived. With the new online probate service, you will be able to pay the probate fees online when you make your application. In time, it is expected to be cheaper to apply for probate online than via the post, and of course there will be no need to pay additional solicitors’ fees. Probate is the name generally given to the process of administering someone’s estate when they die. When someone dies, a formal Grant Of Probate must be obtained from a Probate Registry, which is part of the court system, to enable the estate to be collected in and divided amongst their beneficiaries. There are eleven Probate Registry Offices in England, and one in Wales. Probate is used to describe both the Grant of Probate and the process involved in obtaining it. It includes making an Inheritance Tax return to HMRC and paying any tax due; collecting in the estate from banks, building societies and selling assets if necessary; finalising income tax affairs and pensions; preparing accounts for the estate and paying money due to beneficiaries; including making any gifts as outlined in the Will. There are actually two types of grant: probate and letters of administration. Probate is granted when the deceased left a valid Will, and is granted in favour of one or all of the executors named in that will. Letters of administration are granted where the deceased did not leave a Will but most people still refer to this as probate because, although there are some differences in the process before the grant is issued, for all practical purposes, the two types of grant are the same. Where the estate is less than £5,000 and only includes cash funds held in deposit accounts, you would not normally need to obtain a grant of probate in order to obtain the money. However, where the estate is over £5,000 and includes certain assets, like property or shares, then a grant will need to be obtained before these assets can be ditributed to the beneficiaries named in the Will. If there is a Will, this responsibility falls to the executors named in the Will unless the executors do not want to act. Where there is not a Will, usually the next of kin are entitled to administer the estate and there are statutory rules about which family members that is. The person who is going to obtain probate needs to access the deceased’s bank accounts, investments and other assets in order to pay their debts, inheritance tax and distribute their estate. It is worth noting that no-one who has an interest in the estate of someone who has died can receive their inheritance until a grant has been obtained. The probate process is generally carried out by the executor if there is a Will, or by a court-appointed representative if there is no Will. The executors will need to obtain a Grant of Probate by applying to their local Probate Registry office. Once the grant of probate is issued, the executors are able to carry out their duties in dealing with the deceased’s assets. 1. Identifying and inventorying the deceased person’s estate. The executor will need to investigate the extent of the estate including gathering all information about the assets and liabilities of the person who died. The executor will need to contact the relevant banks, building societies, insurance companies and any other relevant organisations to obtain proper valuations of the deceased’s home, other assets, including stocks and shares; and any liabilities, such as the mortgage. 2. Accounting and appraisal of the estate. The executor will need to complete the inheritance tax return form, currently form IH205 or IHT207. They will also need to contact HMRC to establish the inheritance tax due. Depending upon the circumstances, an accountant or tax adviser might be helpful here to double check the numbers. Once the tax return has been completed in full and filed, the application to the Probate Registry should be made. The Probate application form AP1 now needs to be completed. This form includes details of the inheritance tax that has been sent to HMRC. 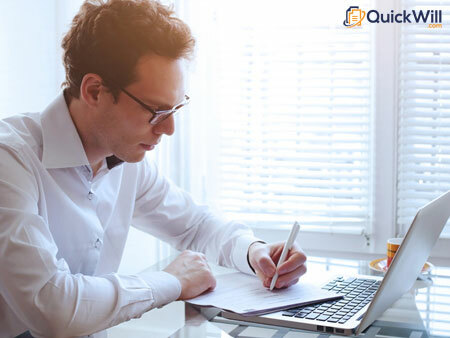 Along with the AP1 from, the executor will need to provide the original Will and three copies of the will together with an official copy of the death certificate. A visit to the the probate office is necessary for an ‘interview’ to take place to ensure everything is in order. There needs to be a formal distribution of the remaining estate as the Will directs. This involves collecting in the assets, and paying the debts of the person who has died, and then distributing the remaining estate to the appropriate beneficiaries in accordance with the terms of the Will (or the statutory order of distribution if there is no Will), and producing final estate accounts for the beneficiaries and a final tax return for the deceased. The hold up here is often selling the property, as that is normally the major asset; and it oftens take longer than people expect. The probate process is relatively straightforward and is a lot less complex than people imagine. Do not be afraid to use specialist legal and tax experts though. However, a word of advice when using solicitors. Obtain a firm fixed price from them for the work you want them to do. Do NOT agree to an open ended pay-by-the-hour arrangement as they will then be incentivised to take longer than is necessary and longer than you would want. Please remember that most probate work is done without needing to employ solicitors, and most of the work involved with probate is administrative. It is often the case that you will be asked to provide the solicitor with extra paperwork and you will be charged £200 per hour or so for a non-qualified legal secretary to do the bulk of the work. As previously stated, the probate process is relatively straightforward and is a lot less complex than people imagine. We hope that this probate guide has been useful, and welcome any comments.